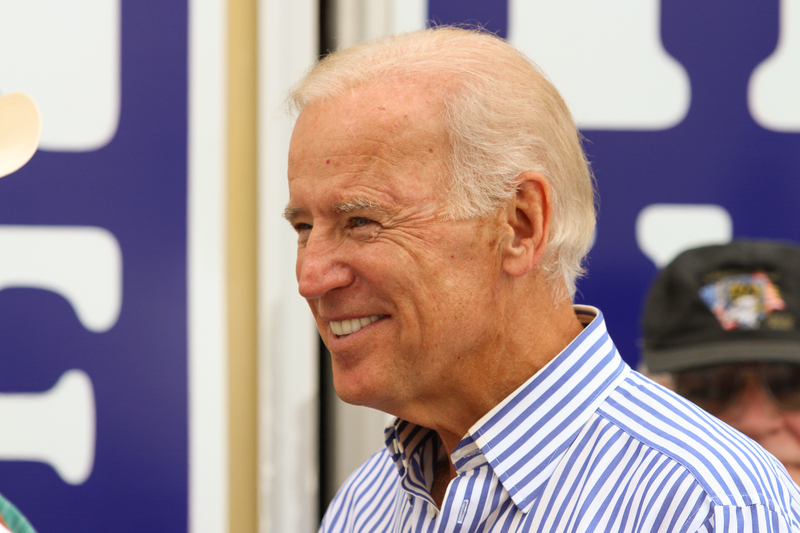 The Johnson County Democratic Central Committee sponsored their third annual James C. Kirkpatrick Heritage Dinner at the Johnson County fairgrounds near Warrensburg on Saturday night. 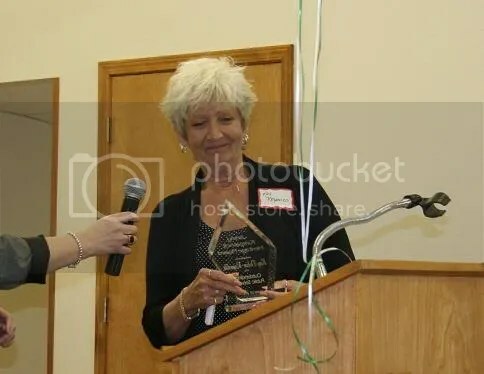 Johnson County Auditor Kay Dolan Reynolds (D) was presented the James Kirkpatrick Award, honoring her public service in the tradition of the legendary Secretary of State. 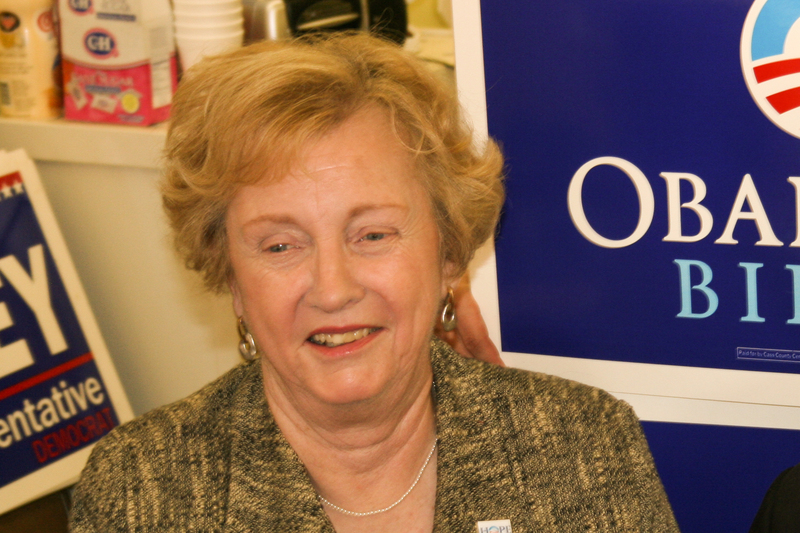 Former Senator Jean Carnahan was the keynote speaker. Senator Jean Carnahan greets a fellow Democrat before the start of the Kirkpatrick dinner in Warrensburg on Saturday night. Johnson County Auditor Kay Dolan Reynolds (D) was presented with the James C. Kirkpatrick Award. 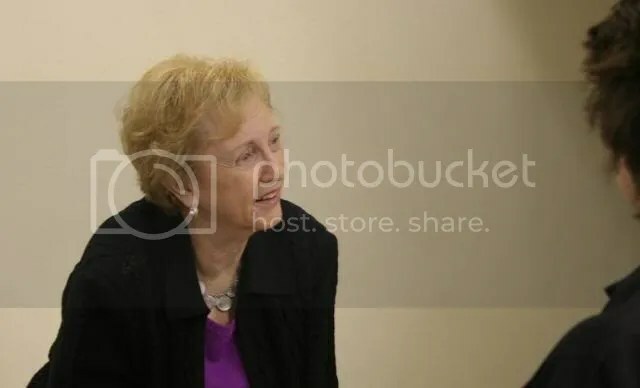 Jean Carnahan: …I’m engaged more fully in what I’m doing than ever before because I believe that we need to be right now. It’s important. It’s the time, and I feel very strongly about a number of things. So I’ve been doing some writing and speaking. I have a blog called firedupmissouri dot com. Do any of you ever go over and read that? I hope you do. [applause] Every day we expose the hypocrisy of Republicans. And believe me, that takes up a lot of space. [laughter] And we highlight the good works of true public servants…. Approximately two hundred people attended the event at the Johnson County fairgrounds. …You know, Missouri is a swing state, [inaudible] we have a fight on our hands for the United States Senate. But let’s put this thing in perspective. As my daughter often says, “I’m not running against George Washington or Abraham Lincoln, I’m running against Roy Blunt.” [laughter] And in doing so, she is running against the ultimate Washington insider, someone who has been living on the shores of the Potomac for thirteen years, someone who could be the poster child for the way things are doing, going wrong in Washington. He was the right hand man for Tom DeLay, directly involved in the reckless spending and the earmarks and most recently, the Wall Street bailout. What we want is somebody who will fight for us for a change, somebody who will stand up for Main Street, not rollover for Wall Street, somebody who wants to fix Washington, and not just add to its brokenness. Well, voters told Robin what they thought of her when she ran for reelection. They gave her more votes than they have ever given anyone in Missouri history. So I think with that kind of support she can win. And with that fighting spirit she can make a difference in Washington. Well, last week I, uh, I watched that historic health care vote and I thought at the times of the words that Robert Frost wrote when he said, we have promises to keep. And as Democrats we have promises to keep. With the American people who count on us, who believe in us, and have no other place to turn. Over seventy-five years ago a woman by the name of Francis Perkins was picked by President Roosevelt to be the Secretary of Labor, the first woman to ever be picked to hold a cabinet level job. She told the president, she said, don’t call me to Washington unless you intend to turn me loose. And the president did. And she arrived in Washington with a hand written list of things she wanted to accomplish. And when we look at that list we think, gosh, those seem so commonplace. And yet those were really radical things in that day. On that list was the forty hour work week, minimum wage, child labor laws, work place safety regulations, and social security. It was a messy fight but Democrats endured and they won the victory. And with that victory Democrats changed what it means to be a worker in America. They changed what it means to grow old in this country. We now have hope and we now have health. So what did the republicans do? They denounced these accomplishments every step of the way, saying they were going to put us on the road to socialism. They made the same claim when Truman tried to get through a health care program and increase minimum wage and give tax breaks to middle class families. Doesn’t this all sound very, very familiar? When Truman was dealing with that idiot Congress, Senator Robert Taft said, we’re not giving him anything. Doesn’t that sound familiar? But that year Truman ran against the do nothing eightieth Congress and he won a stunning victory. And since then Democratic Congresses have given us the GI Bill, Peace Corps, the Civil Rights Act, the Voting Rights Act, Medicare, the school lunch program, Head Start, family and medical leave, and Title 9….And soon we will give America health care reform and wall Street reform. [applause]…. ….So, what should you and I do as democrats during these next seven months? Too many voters think it doesn’t make any difference what we do. But in Missouri grass roots activity makes a big difference because elections here are decided by the narrowest margins. Obama lost Missouri by thirty-nine hundred votes out of three million cast. That was one tenth of one percent of the vote that was cast. Keep in mind these votes, these, uh, these numbers as well during the coming months. Forty-five percent of Missourians will vote Democratic, no matter what happens. You can take that to the bank, foty-five percent of them will do it. Forty-Five percent will vote Republican, you can count on that. That leaves that little sliver of ten percent and we will spend millions of dollars and fight very hard for that ten percent, a group that often bases its vote on who talks to them last. And all the while we will be trying to get out our base vote and in an off year election where there’ll be hundreds of thousands of fewer votes. What you do here in Johnson County can and will make a difference….That we realize that what you do when talking to friends and neighbors and getting them to register makes a difference in Missouri. We win by very small amounts. And we lose by very small amounts…. ….Everybody needs you. Now, imagine living your life realizing that everybody really needs you. Jimmy Kirkpatrick understood that. Francis Perkins, that early labor leader, understood that. Robin Carnahan understands that. Mel Carnahan understood it. Democrats understand that we need to be there for each other. Our country needs you, our party needs you, and these candidates need you. 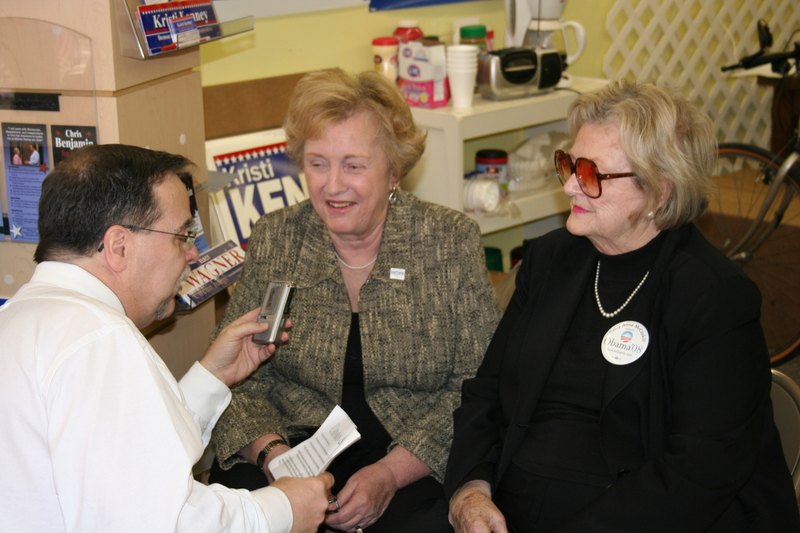 Betty Ann McCaskill (Claire’s mom) and Senator Jean Carnahan stopped in Warrensburg this afternoon on their Missouri “Heartland Tour”. 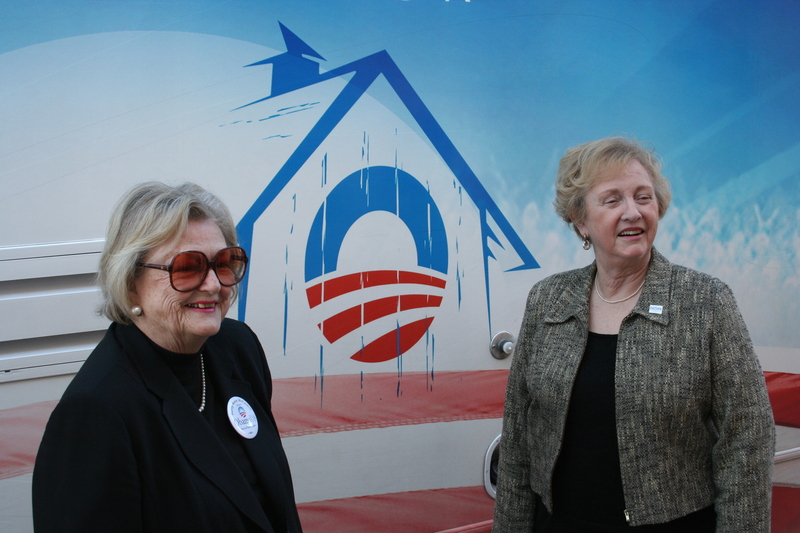 Betty Ann McCaskill (left) and Senator Jean Carnahan (right) next to their “Heartland Tour” motor home. SMP: …is about health care. And, in rural Missouri. You’ve been to various parts of the state. So, what, what areas have you traveled to? Jean Carnahan:…Sullivan, Washington, Rolla, Marshfield,…Waynesville, Springfield. That was the first trip. SMP: What are their concerns? …SMP: Are you finding that people you talk to, voters, are aware of the differences in the health care proposals? Betty Ann McCaskill: Well I think one of the…I think the place that we heard the questions about it. They were most concerned around the Springfield area where the medicine is a big, big item. The hospitals there are wonderful big hospitals. And I think there are people, particular in those areas, that worry about socialized medicine. Betty Ann McCaskill: And the difference between Obama’s plan, and I think the best difference, is that there is a choice. The people can choose either one of the privatized plans and stay with the doctor they want or go with another plan that would help them better, those that need more financial help. And his plan will cost the average family about twenty five hundred dollars a year less. And these particulars, and I think particularly the idea that they can choose. The idea that it’s individual health plans for the average Missouri family. That’s what their major concern is. “Can I get health care on an individual basis?” And also cover pre-existing conditions? This is very important. How many people do we know that end up needing insurance but they have a previous history of cancer and they can’t get insurance? Well, who needs it more? They guy who’s perfectly healthy, or the person who has cancer? SMP: Have you encountered people who have told you stories about a lack of health insurance? Jean Carnahan: Um, hmm. Yes, we do. Jean Carnahan: Well, there was one that the people around St. James were telling us. Jean Carnahan: Remember that one? Jean Carnahan: The fellow who was in, I guess he was in, he was a soldier. He came back. And he went to work for the police force. And was injured on duty, I think, there. 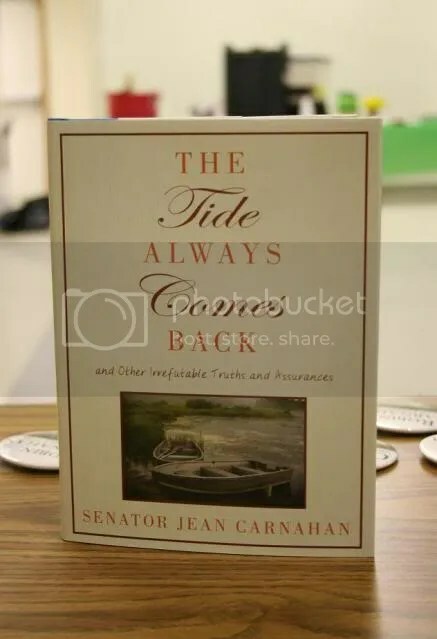 Jean Carnahan: And then was unable to get any health benefits, either from the government or from, from his health, from his insurance. And so it seems a pretty pathetic story. And, you know, everybody has some variation on the same thing, just not being able to get adequate affordable health care. And Barack Obama is going to assure that the, that at least twenty five hundred dollars will be reduced from the costs up to that amount. And, you know, McCain, he wants to tax the employer based health. And, you know, we’re just not used to that. We haven’t had that in the history of our country. Betty Ann McCaskill: That is totally unheard of. 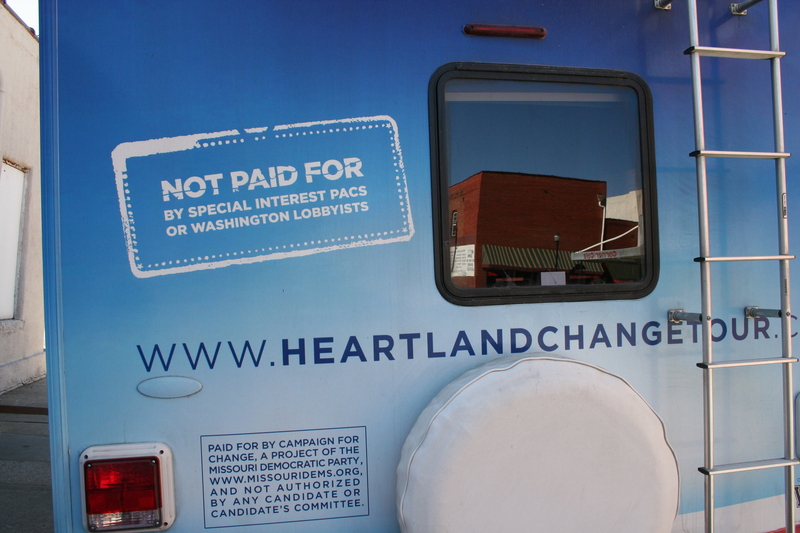 Jean Carnahan: And, of course, he wants also to cut Medicaid, Medicare to be able to pay for his health program. And then told us that he wanted to deregulate health care, like [garbled] deregulated the banks. Betty Ann McCaskill: Ha. Ha. We know how that worked out. Jean Carnahan: This is not a happy scenario. But, so, I think when you compare the two I think people certainly would see Barack Obama is more inclined to give better coverage to more people. And that’s certainly what the comparisons have shown. Betty Ann McCaskill: And in that, in that area, what about the returning veterans that we’re getting back? And I know my daughter Claire particularly, and Barack Obama, went over to Walter Reed and found abominable conditions. Do you think John McCain had never walked through that hospital and seen that there were people not getting care at all? And all of a sudden, some emphasis was paid to these returning veterans who needed health care. And, at this point we now have a bill that’s gonna give them all of the extras that my husband got when he got back from World War II. And that’s very necessary. I think the people in Missouri particularly will appreciate the fact that veterans will receive the benefits they deserve. SMP: well, thank you very much for your time.